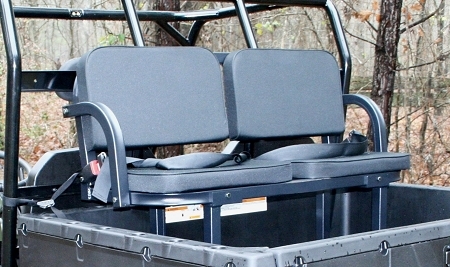 The Heavy Duty Deluxe Rumble Seat will add a touch of class to any popular utility vehicle. It features plush, durable, cushions covered in 600 denier PVC coated polyester. 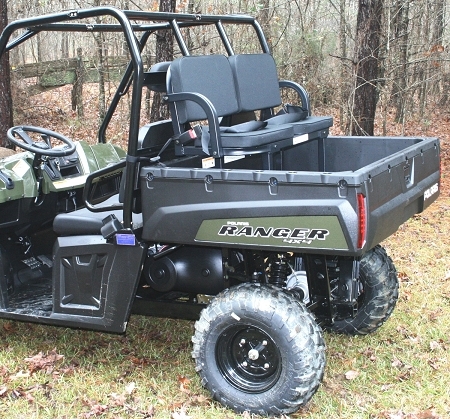 The Deluxe Rumble frame is constructed of 1½ inch, heavy-duty aircraft aluminum and finished in a deep powder-coat of black enamel to match and complement all brands of UTV’s. Each Deluxe Rumble Seat HD comes with safety straps and seat belts to insure safe transport of your passengers. When installed, the safety straps disable the bed’s tilting function. The Deluxe Rumble Seat also features quick-detach brackets that allow instant installation and removal to accommodate changing needs. The total weight capacity for the deluxe model is 350 lbs. 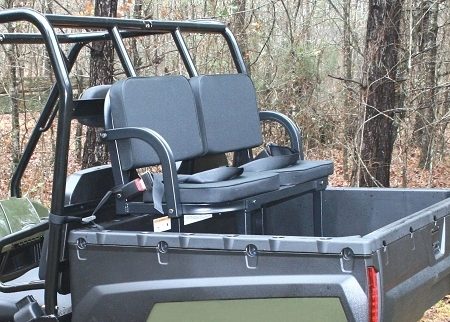 The Deluxe Rumble Seat works well with all the popular brands and models of UTV’s such as: Polaris, Suzuki, Kawasaki, Artic Cat, Kubota, Club Car, John Deere, Imported Mini-trucks, Yamaha, and Cub Cadet. Warning: Passengers must 18 years old to use the Deluxe Rumble Seat. *Deluxe Rumble Seat is made of heavier duty aluminum but has same dimensions as our Rumble Seat—Original.